Why not spoil yourself with the most famous dessert of Sicily, cannoli! 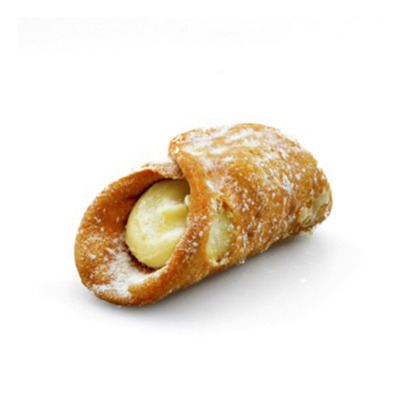 Made with delicious fried pastry dough, these tube shaped shells are filled with wonderful white chocolate cream and dusted with sweet icing sugar. 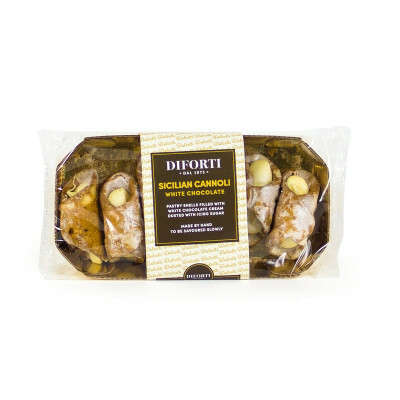 Enjoy this Sicilian delicacy with a hot cup of coffee or tea. Pastry : Flour, palm oil, sugar, fructose , honey, salt, Egg white powder, Butter (Milk) Dried yeast, flavourings. 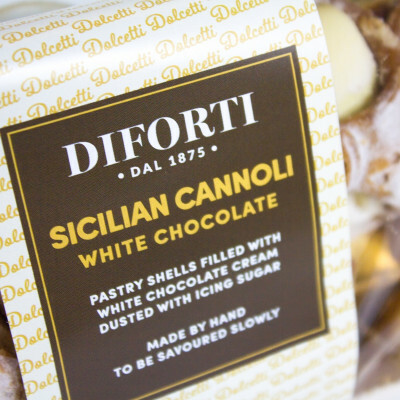 White chocolate filling cream (33%) : Sugar, vegetable oils (sunflower palm) , skimmed milk powder, whey milk powder, lactose (milk) emulsifier : soya Lecithin, flavourings. Decoration: Dextrose, wheat starch, vegetable fats (Palm, coconut) , vanillin. 6 months. Store in a cool dry place, away from direct sunlight and keep away from heat. Keep in an airtight container in a cool dry place, away from direct sunlight and keep away from heat. Shelf life once opened : 15 days.